Have the ultimate party with multiple advanced sound to light disco modes. Adjust strobe, intensity, hue and more! The best on Windows 10 and supports anything you play on your device, i.e Spotify, YouTube etc – No mic required! Fully supports the ultra low latency Hue Entertainment API. Did you know that your Philips Hue dimmer switches, and Philips Hue Tap devices can do so much more than what the official Philips Hue app offers? 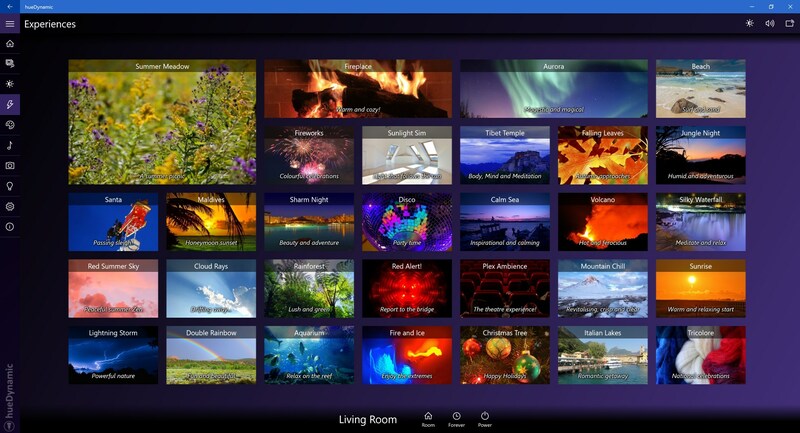 hueDynamic offers many advanced actions that are just not possible with other apps, allowing you to break free from your computer and mobile and make your smart home more “guest friendly!“. Create your own custom photo ambiences and enhance the colors with our “Tweaks!”. Photo ambiences are stored on the Hue bridge with our OmniScene technology, meaning you don’t have to recreate the ambience for different rooms. Not only that, they are accessible from all your devices – the only app on Windows 10 to have this functionality! Quickly create the perfect ambience for any occasion using hueDynamic’s online Philips Hue scene gallery. Categoried for swift navigation and with manual search, a single tap allows you to import the perfect scene to your Hue bridge. We also love different types of hue lights, such as White Ambience and Phoenix, Osram and Dresden. We convert colors to appropriate color temperatures for lights that don’t support color in real-time. Craft your own color palette for quick access. Other apps don’t go the extra mile as we do! ... and YouTube! Our disco mode can use peak or advanced FFT multi-band analysis. We use output device loopback sampling for the lowest latency light show of any app! Control your lights with simple commands, such as "Hey Cortana, lights off in the kitchen." or "Hey Cortana, start fireplace in the living room for 20 minutes". We display the current temperatures from your Hue motion sensors inbuilt thermometers on the app home screen. Keep tabs on the temperature changes around your home. Great Hue controller app . I mostly have been using my IOS devices to control my Hue system. Many apps there are either $ scalpers for scenes and effects, or, are just plain junk. This app appears to be crafted by a developer who has been making frequent updates and new features, and who doesn’t believe in milking his users for decent effects. The Disco mode is quite good, and is still being tweaked. Also the support and info on his website is superior to most that I’ve seen in Apple land. A bonus is that I can also use this app on my XBOX One, with no extra payment. I’m looking forward to a “bright and colorful” future with this app! 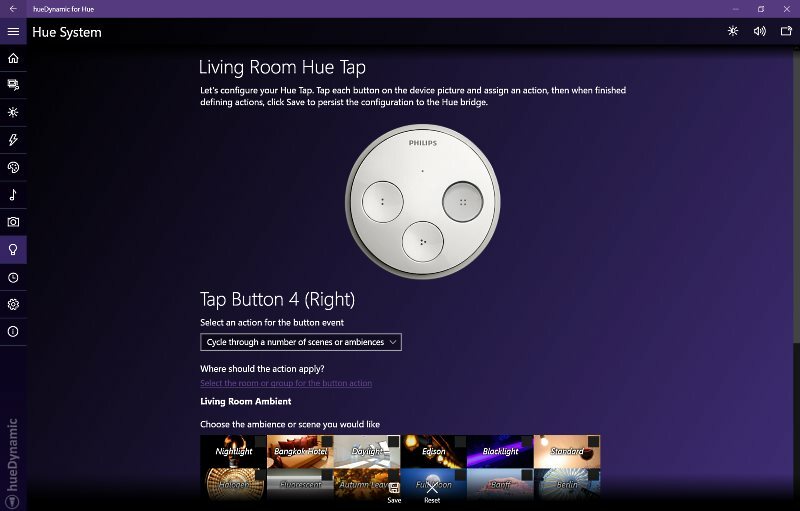 The best Windows Hue app on the market at the moment. 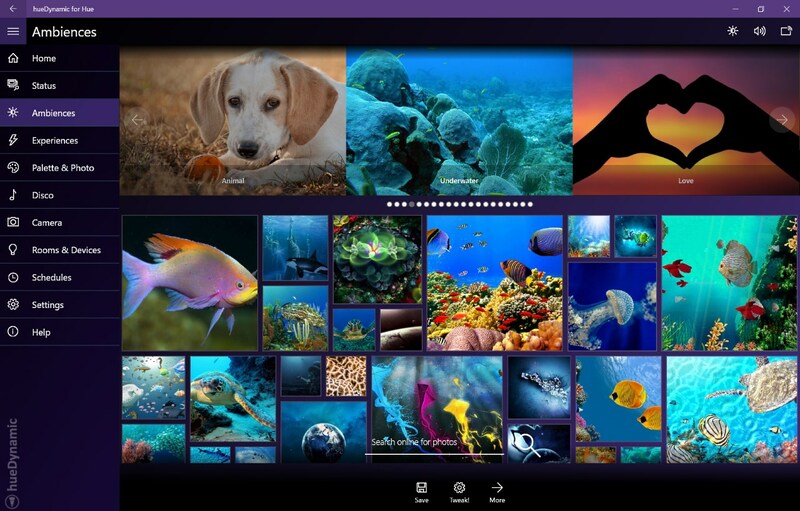 I have used a couple of other Hue app on Windows, and this is the best of them, I have it installed on my 950XL, Surface Pro, desktop and Xbox One, and will also purchase this app for my wife for her 950, Surface Pro and Xbox. After my first submission I contacted the dev and suggested a timer function, this has now been added and I can happily say this app is now my exclusive Hue app, as mentioned it runs on my 950XL, Surface Pro 3, desktop PC and Xbox One and I can happily give this app 10 out of 5. Well done HueDynamic on a really impressive Universal app. Worth it for disco mode alone! There’s a ton of presets here for different lighting settings, all of which are great, but really it’s worth the price just for the excellent disco mode. I’ve used other apps trying to do the same thing using my phone mic, but this beats them hands down. It’s triggered by whatever’s going through your sound card so it’s very fast and highly configurable. Excellent app. I wonder how I can install Hue lights in the floor so I can go full Travolta! How apps should be! The best hue app. I’ve tried loads of apps but this is the best. The sheer number of features it has, the best disco mode of any I’ve tried including android and iOS, great dynamic scenes etc etc. I use it on my mobile and laptops. Couldn’t be happier. Best Hue app AND the dev is extremely responsive. I don’t normally write many reviews but I have to say this is the best Windows Hue app out there, it has a ton of features and no in app purchases to force you to pay more to get all the goodies. The developer is the fastest and most responsive developer I have came across on Windows. I emailed asking for the ability to control an individual light bulb rather than a group on Sunday at 1:30am UK and the developer responded extremely quickly back thanking me for the feedback. Then within 24 hours an update was out that added the feature! I was so surprised it was implemented on a Sunday and updated so quickly but you do really get developers that are truly committed to providing amazing support. Buy it for the features and the massive support the developers provide. Its really worth it and if you think it needs a feature simply ask and I am confident they will do anything they can to accommodate your request. This is NOT a vapourware app! Great app on the Windows platform. Excellent implementation. Works perfectly. Nice animations with the lights. Great potential for future scenes too. 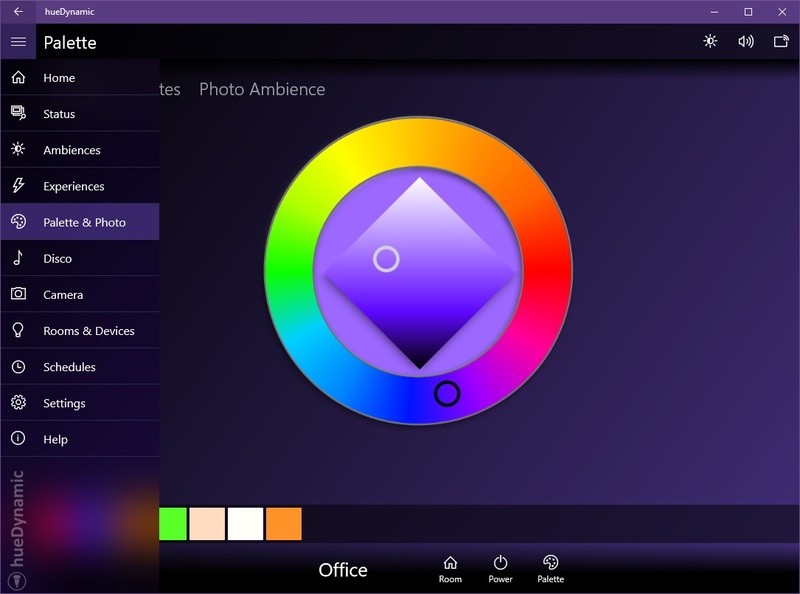 Well worth the price if you have Hue, and are using the Windows environment over Apple. Well done, great application, being used on my phone, Xbox and PC’s. Fantastic app! Everything about this app I love! The dynamic scenes are amazing, and it includes features that I have been looking to use on Windows but haven’t previously found such as music syncing and camera syncing! 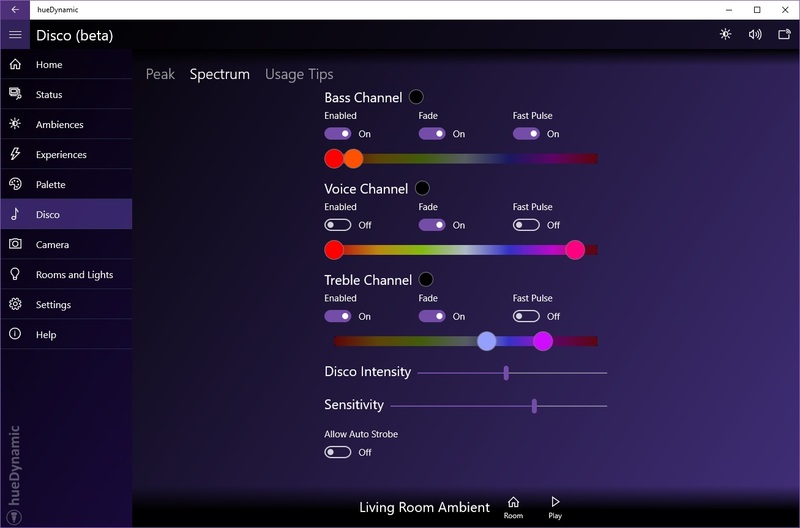 If you are looking to use your hue lights on Windows, this is by far the best app you can get! Great job on the Disco Music Mode! This has been the best app on Windows or my Android phone when it comes to responding to the bass and treble and overall is a great controller app and can’t wait to see what’s added next! Highly recommended. YES!!! Works great and it’s effects are better than Android and iOS ….lots of features. Now this a real app! The best hue effects app period. It has the lowest latency for disco mode out of all apps I have tried, the ambiances are amazing and the app is absolutely beautiful/easy to use. I cannot recommend it more!